Now that the holiday season is in full swing, your decorations are up and you're preparing to have company, you may have forgotten to spruce up the look of your washroom. Luckily, there are more than enough ingenious style choices you can use in this space to highlight some of your bathroom's best features and introduce a slew of holiday hues. There are a number of quick and easy bathroom accessories you can incorporate into your space, so look first to your bathroom vanity as a blank canvas. You can incorporate a few scented candles, holiday-themed towels and other little bits of flair to infuse the space with a bit of festive color. A centerpiece may look like it belongs on your dinner table, but it can give your washroom a visual boost. Combine a few winter accents into a small bowl, such as ornaments, pine cones, garland, tinsel or anything else you have left from your decorating scheme. This will be a jaw-dropping addition that your guests are sure to love. The holiday season is your perfect excuse to show off your decorative flair, so take advantage of the opportunity! 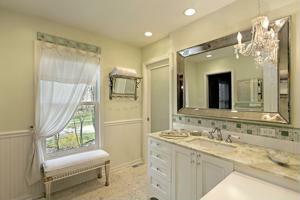 How will your bathroom stand out this year?